An inexpensive current meter based on the drag principle is being designed and developed. It provides a simple, elegant, robust, and low-cost solution for measuring currents at the ocean bottom or from any fixed platform. Its operation is based on the drag law of a buoyant tethered cylinder in flowing water. Three-axis accelerometers measure tilts which are converted to a horizontal velocity vector. Special tethered attachment enables estimation of not only the magnitude but also horizontal direction of the current. The same accelerometers are also used to construct a simple stick-and-float tide gauge. The performance of the instruments is being evaluated in field tests in Waquoit Bay and Nantucket Sound. 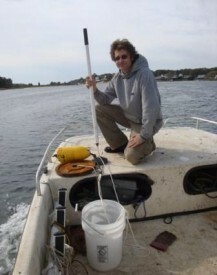 Arrays of the instruments deployed for periods from days to months are used to record tidal and higher frequency oscillations in the Waquoit Bay. A dramatic double peaked flood (double height) tide arising from nonlinear interaction with bathymetry is studied. Strong seiches with periods of about 15-30 minutes are also recorded in some parts of the Waquoit Bay system.